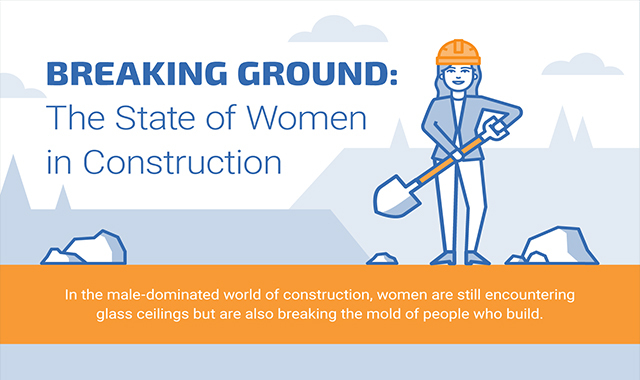 The State of Women in Construction #infographic ~ Visualistan '+g+"
When you think of any male-dominated industry, construction is probably the first job that comes to mind. Of all the people who work in construction, women comprise only a small nine percent of the workforce. Even smaller is the number of women directly working on the front lines of a construction site—there is only one woman for every 100 employees on the field. These are several factors that explain this enormous gender gap, from unconscious gender bias to lack of adequate training to overall perceptions of women working in a “man’s world.” Despite these barriers, women continue to build their path in the industry – according to Randstad, nearly one-third of companies promoted a woman to a senior position last year. As the need for skilled construction workers grows to 1.6 million people in the next five years, companies are looking to recruit more women to bring their skill sets into the field. So, what is the current state of women in construction? To answer this question, we compiled key statistics and examined the backgrounds of female leaders from around the construction industry. Check out the infographic below to learn more.